I don’t think paleontologists really study goats much, either…. That was why I picked the panel, but I couldn’t think of a pithy way to fit that into the title. Sometimes the format I’ve set for myself on these is very constrictive! 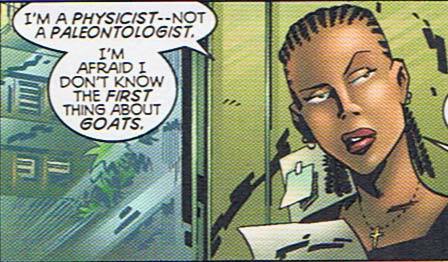 I love that about it, that either she or the writer doesn’t know what the hell a paleontologist does. Given that Keith Giffen is the writer, I bet it’s a back-handed slam on physicists, who tend to be dismissive of any other discipline. But either way, it’s a funny line! Oh, Giffen. That explains it.